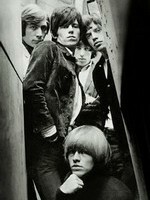 It was 56 years ago Sunday (April 14th, 1963) that the Beatles and the Rolling Stones first met. The Beatles, who were new on the scene in London, had heard about the group through word of mouth, and were in the audience at the Stones’ show in Richmond at the Crawdaddy Club at the Station Hotel. Shortly thereafter, George Harrison personally recommended that Decca Records — the same label that had passed on the Beatles — sign a deal with the still-unknown Stones. The two bands, which were pegged as being rivals in the rock press, were actually very close. John Lennon and Paul McCartney wrote the Stones’ second single, “I Wanna Be Your Man” — which the Stones chose as their opening number last December at the kick-off of their 50 & Counting shows. Throughout the ’60s, McCartney and Jagger coordinated their record release schedules and staggered their releases, so that they wouldn’t have overlapping hits which would force fans to pick one band over the other. The Beatles’ inner-circle on the mid-’60s “Swingin’ London” club scene included Jagger, Keith Richards, Brian Jones and the Animals‘ Eric Burdon. George Harrison was at Keith Richards’ house just prior to Jagger and Richards’ infamous 1967 drug bust. Jagger and Richards attended several Beatles recording sessions, including the legendary orchestral overdub of the group’s “A Day In The Life” track. Lennon and McCartney contributed backing vocals to the Stones’ 1967 single “We Love You,” and Jagger returned the favor by attending the “All You Need Is Love” global satellite broadcast. That summer, Jagger and his girlfriend Marianne Faithfull traveled with the Beatles to Bangor, Wales for a weekend lecture with the Maharishi Mahesh Yogi. It was there that the Beatles learned of the death of their manager, Brian Epstein. Around that time, the Beatles and the Stones tossed around the idea of starting their own joint record label. John Lennon made his first-ever solo appearance at the Stones’ December 1968 taping of their Rock And Roll Circus, performing “Yer Blues” with the makeshift band called the Plastic Mac, which included Keith Richards on bass, Eric Clapton on lead guitar, and the Jimi Hendrix Experience‘s Mitch Mitchell on drums. For a brief time in 1969, the two bands shared a manager, the American-born accountant Allen Klein. In 1971, both McCartney and Ringo Starr — who were not on speaking terms — attended Mick and Bianca Jagger‘s wedding in St. Tropez. Lennon and Jagger collaborated several times in the studio. In 1973 Jagger added guitar to Yoko Ono‘s Approximately Infinite Universe album, and in 1974 Lennon produced a version of Jagger singing “Too Many Cooks,” which has only recently been released. In 1979 Ringo Starr and former Stones bassist Bill Wyman performed together on Jerry Lewis’ Muscular Dystrophy Telethon. In 1981, Stones guitarist Ron Wood co-wrote produced several tracks for Starr’s Stop And Smell The Roses album. Keith Richards also took part in the sessions. In 1986 McCartney performed onstage with Jagger and David Bowie, playing acoustic guitar during the Prince’s Trust Concert, when the pair performed their hit remake of “Dancing In The Street.” Jagger, who was unhappy with his performance, wouldn’t let his and Bowie’s portion air in America. Julian Lennon performed with Keith Richards in 1986 during the filming of Chuck Berry‘s 60th birthday concert film, Hail! Hail! Rock N’ Roll. He later recorded a cover of the Stones 1967 hit, “Ruby Tuesday. His brother Sean Lennon was briefly romantically linked to Mick Jagger’s daughter, Elizabeth Jagger. In Keith Richards’ 2010 autobiography, he revealed that he and McCartney had actually struck up a close friendship starting earlier in the decade. In 2012 Paul McCartney — along with Rod Stewart — served as Ron Wood’s best man at his wedding to Sally Humphreys. On March 27th, 2013 Wood and McCartney joined McCartney’s son James McCartney onstage during his performance at London’s Ambassador Club. Most recently, ton February 15th, 2015, Keith Richards introduced Paul McCartney’s performance of “Maybe I’m Amazed” on NBC’s Saturday Night Live – 40th Anniversary Special. On April 14th, 1966 the Beatles recorded their 12th U.S. chart topper, “Paperback Writer.” The song, which was recorded during the group’s Revolver sessions, was the first to prominently feature Paul McCartney‘s Rickenbacker bass guitar as a lead instrument. “Paperback Writer” was not included on Revolver, but released as the group’s spring single. It went on to top the charts for two weeks in the spring and early summer of 1966. It was the only song from their current set of sessions to be included on the 1966 tour, which proved to be their last. McCartney resurrected the song in 1993 and played it on his New World Tour. It was eventually included on that year’s Paul Is Livealbum. “Paperback Writer” — now featuring McCartney on lead guitar and including an extended coda — is now in his current concert rotation and featured on the 2009 Good Evening New York City live album.